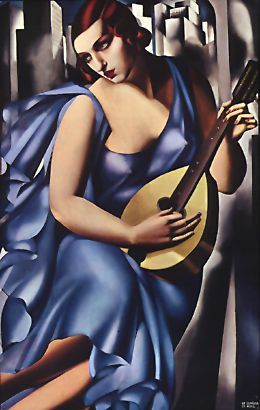 La Belle Rafaela was supposed to have been Tamara Lempicka’s favourite painting, perhaps in part for the charm of the background story. Painted in Paris, the subject Rafaela was a young, pretty, vivacious and especially curvaceous girl that she met on the street. Unbeknownst to them a shy student watched painter and model from across the way and the more days he watched the more he fell in love, until unable to contain himself, he confessed he had been peeping. Surprisingly perhaps, the upshot was not a slap in the face but marriage. Lempicka lost both model and lover. Tamara Lempicka had a long and eventful life, born in Poland, she died at the age of nearly 80 in Mexico. She was fortunate to live long enough see her work come back into fashion, a destiny afforded to few artists of the same period. Perhaps because her work came to typify an époque, an age that became glamorous again in 1970s. More of a gay socialite than an avant-garde artist, she popularised cubism for a smart, cosmopolitan set. Her beauty and intelligence allowed her to whirl through the beau-monde of pre-war Europe collecting lovers of both sexes and painting portraits wherever she went, a courtesan who sold her work as well as herself. Famous her encounter with D’Annunzio, poet, fascist man of action and despite his lackluster physique, tireless womaniser -Tamara was a must for his collection. Their courtship was mainly epistolary and when they met to paint his portrait, she later said, “I don’t know what I expected, but I found a lecherous dwarf”. This was one butterfly that escaped him and sadly the portrait went unfinished. The striking, hard transversal spotlight lends itself to photography as Tamara herself borrowed the technique from cinema lighting. But whereas the cinematographer would soften the harsh spotlight with soft focus, the painter uses the hardness for effect. Art Deco made much of these hard lines, flat surfaces with acute angles; her genius was to encapsulate the essence of Deco in her portraits. Each portrait has one dominant colour so that one could make a rainbow exhibition of her work arcing from the red of Bella Rafaela on to the blue of “The Musician”, the brilliant, brief spectrum of the Jazz Age. A curiosity of the painting is that although high in detail the model is Eve herself, she has no navel.